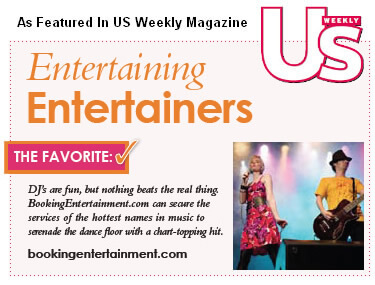 BookingEntertainment.com was established to do most of its business at the private and corporate level. A corporate retreat at the Grand America Hotel? Or a private surprise party at Hotel Monaco? If you've got an upcoming event or party scheduled in Salt Lake City, you'll be surprised to learn how easy it is to book a band, comedian, or celebrity to appear at your event. For almost twenty years, Booking Entertainment has been helping clients with full-service turnkey concerts and events, including big name entertainment for their events in Salt Lake City, all in one no-surprise price. Almost any band, comedian, or performer is available to help make Your Event In Salt Lake City a genuine success, and Booking Entertainment can not only coordinate such an appearance for you, but also oversee all the elements that go into producing the live entertainment portion of your occasion. These elements include not only an onsite staff to produce the musical portion of the event, but also fees, flights, ground transportation, hotel accommodations, staging, sound, lights, backline equipment, per diems, and misc. rider requirements. It's a lot to consider, but in knowing that all is being taken care of by Booking Entertainment, clients are free to relax and enjoy the evening with their clients, guests, or family. Let's begin with the Entertainment Request Form. In filling it out, you will be able to provide us with the details of your upcoming event in Salt Lake City. An agent will contact you within twenty-four hours to discuss the process with you and answer any additional questions you might have. After selecting the appropriate entertainment, you'll be given a turnkey price by our agent, one that includes all the details mentioned above. At this point, clients can confirm whether or not they wish to proceed, and the agent will submit the formal offer to the act. Upon acceptance of the offer by act, contracts are issued and Booking Entertainment handles everything else. Booking Entertainment, with its almost twenty years in the business, is ready to help you make your event or party in Salt Lake City an exceptional experience. You can choose to have us act as an agent by handling just the contracting of your chosen talent, or we can also act as a producer and handle the entire entertainment portion of your event as well. Once you know how you would like to move forward, simply submit your non-obligatory Entertainment Request Form below. We have a wide range of acts and packages with information available on this site. But if even after searching them, you don't find what you're looking for, let us help you pinpoint the best act for your event. If you have additional questions, please do email us. We are committed to ensuring that your party or event exceeds your expectations.